Multi-ethnic, multi-cultural Malaysia is home to a fairly substantial Indian population. It is believed that Indians at present make up approximately 7% of Malaysia’s population of 29 million people. The Indians in Malaysia largely hail from the southern Indian state of Tamil Nadu and they were initially brought to Malaysia to work on the country’s rubber and palm oil plantations by the British in the late 19th century. Sikhs believe in the power of communal prayer and hence wherever a Sikh community settles, a gurudwara is soon established to meet the various cultural, religious, educational needs of the community. A gurudwara inherently differs from a Hindu temple for the core belief of Sikhism states that god is formless and Sikh scriptures denounce idol worship. Hence there are no idols in Sikh gurudwaras, but the center of attention is the much venerated Sikh holy book, the Guru Granth Sahib. A gurudwara is usually made up of several sections like the durbar (the main hall), the langgar hall (where food is prepared and served by volunteers) and the sachkand or inner chamber where the Guru Granth Sahib is stored at night. During the day, when this ‘house of god’ is open for worship, this holy tome is usually placed on an elevated platform facing the entrance. All gurudwaras are further adorned with a flag pole called ‘nishan sahib’ on which the triangular Sikh flag is raised. This flag is traditionally made of cotton or silk and is usually of a deep orange or yellow hue. The flag additionally features a symbol (the Sikh coat of arms) known as ‘Khanda’. 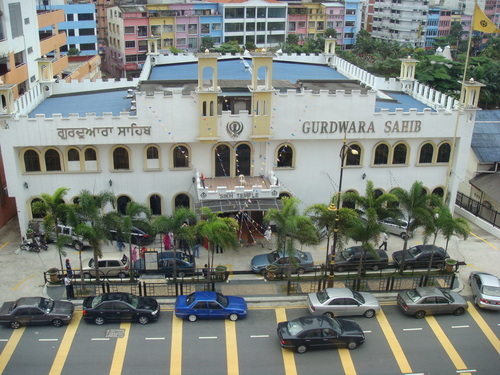 Malaysia is believed to be home to 119 Sikh gurudwaras or Sikh temples. The state of Perak, which is home to country’s largest Sikh community hosts 42 of these gurudwaras. Located in the heart of the capital city, in the traditional Malay enclave of Kampung Baru, is the magnificent edifice of the Tatt Khalsa Diwan gurudwara. The structure of this gurudwara is believed to have been inspired by the famed Golden Temple of Amritsar. The Tatt Khalsa Diwan gurudwara is a prominent tourist attraction in KL,for it is known to host the largest and perhaps the most beautiful prayer hall in all of Southeast Asia. The Gurudwara Sahib Seremban was believed to have been founded in the early 1900’s, by a Sikh para-military police force which was stationed in the area. Today, the gurudwara caters to the needs of the local the Sikh community of Seremban though it also serves as a prominent tourist attraction. The Gurudwara Sahib in the Mukim of Setul dates back to the 1890’s and is known to be the oldest Sikh Gurudwara in the State of Negeri Sembilan. This gurudwara was believed to have been constructed by Sikhs who worked as watchmen in the tin mines of the area. The original structure of this gurudwara consisted of wooden planks topped with a roof fashioned out of wood from the attap trea. The gurudwara has undergone many structural changes down the ages. Today this magnificent place of worship is one of the busiest gurudwaras during Sikh festivals. Historical records indicate the existence of a Sikh community in the state of Johor during the late 19th century. These Sikhs were employed in the police force though some also served in the guard force belonging to the Johor Sultan. The Sikhs requested the Johor Police for a piece of land in April 1916, for they wished to build a gurudwara on it. They were finally allotted a muddy and swampy plot of land in 1921. They then went about reclaiming the land by filling it with sand and stones as they went on to construct a gurudwara on it using much timber. This original structure lasted for many years until it was rebuilt in 1960. 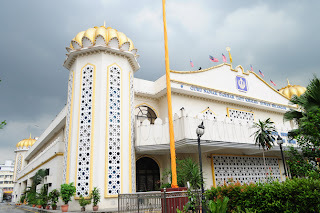 Today, this Gurudwara Sahib not only serves the various needs of the Sikh community in Johor but it is also a prominent attraction located in the heart of the city of Johor Bahru, the capital of the state of Johor.